While we know that breakfast is the most important meal of the day, ideally giving you enough protein and nutrients to get you through the morning, we sometimes fall short on the breakfast prep side of things and end up rushing out the door with just a few bites of toast in our bellies…. In an effort to up our brekky game, we knew we needed to find dishes that were easy and delicious, and that didn’t slow us down too much in the mornings. Thankfully, this blueberry breakfast bake fits the bill, resulting in a yummy, super filling dish that you can prep ahead of time and then just pop in the oven when you’re getting ready in the morning. 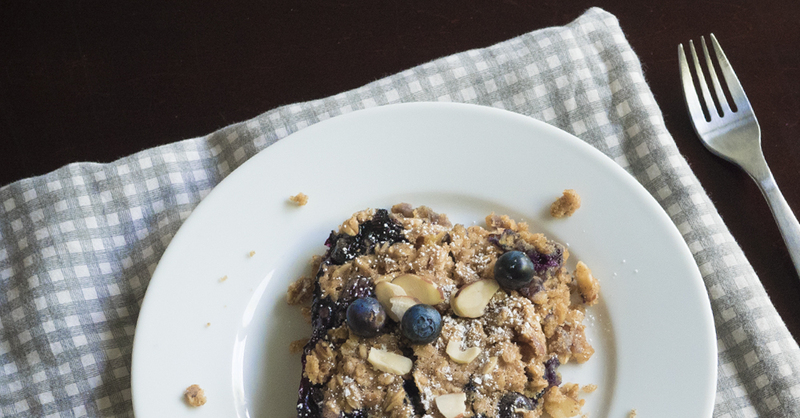 Packed with blueberries, oats and almonds, this recipe will help you get ready for the day – plus you can make a big batch and then be set for the rest of the week! Preheat oven to 350º and lightly grease a 9x13-inch baking dish with butter or nonstick spray.